Here is my first cooking-related post! I am not the best cook in the world, but I am making more of an effort these days to cook for myself more and try out different types of recipes that will have a minimal effect on my belly – and also improve my cooking skills in the process! This recipe is based on the “Herbed beef meatballs with creamy potato nutmeg mash” recipe from the book Food Intolerance Management Plan by Dr. Sue Shepherd. I have made it with mashed potato before, with some green veggies as well, however this time I decided to try the meatballs with a tomato-based sauce and gluten free spaghetti instead. The sauce is my own recipe. Overall, this recipe should make enough to serve 4-6 people. Combine minced beef, eggs, bread crumbs, herbs, salt and pepper into a large bowel and mix well. Using your hands, roll the meatball mixture into walnut-sized balls. Spread them out on a large plate and cover with cling wrap. Put the plate with the meatballs into the fridge to set for 10-15min. Tip: The meatballs will be easier to roll if you wet your hands with water first. Bring a pot of water to the boil to cook the spaghetti. Once the water comes to the boil, add the spaghetti and cook for approximately 10min, or to the consistency you prefer. Heat up a large frying pan with a small amount of cooking oil. Depending on the size of your pan, fry 8-12 meatballs at a time, for about 5min per batch, so that the outside surfaces are sealed. Line a tray with baking paper. Once the meatballs are fried on the outside, place them on the tray and put the tray into the oven to cook further while you fry the next batch. Once all of the meatballs are fried and in the oven, leave them for another 5-10min, or until browned and cooked through. While the meatballs are cooking in the oven, combine the tomato passata, canned tomatoes, herbs, salt and pepper in the frying pan, and heat the sauce on a simmer. Once the meatballs are cooked through in the oven, add them to the sauce and gently stir through so that the meatballs are coated in the sauce. Add to the cooked spaghetti and serve, with a little bit of cheese on top! For this recipe, I used some very specific products for most of my ingredients, which I have found to be useful for limiting the amount of fructose in my meals. All of these were bought from my local Woolworths supermarket. Here are some notes about these products, apart from the minced beef, eggs, salt and pepper, which are just standard products. Bread crumbs – This time I used the “Gluten Free Bread Crumbs” from the shop GlutenFree4U, because it was also marked as being “fructose friendly,” but I have also previously used the “All Purpose Rice Crumbs” by Orgran. Herbs – I used the “Italian Herbs stir-in paste” by Gourmet Garden, which is good because it is an easy way to add herbs, without any additives that could affect my belly. Tomato passata – My favourite tomato passata is by Val Verde, and it is great for sauces because it is just a pure tomato puree, and therefore without any added onion powder or garlic. Canned tomatoes – Along with the passata, I used diced tomatoes in this recipe to add some texture to the sauce. Because they do not have any onion or garlic, canned tomatoes are a good base to make your own fructose free pasta sauce. There are two brands that I like to use: Ardmona, and Macro. 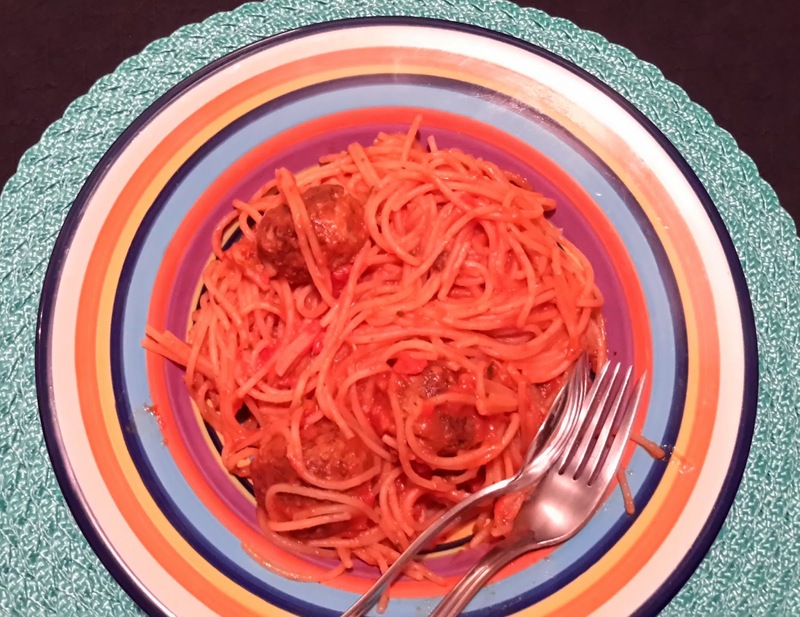 Spaghetti – For this recipe I used the San Remo “Gluten Free Spaghetti” (see image below), which is a good option because it is made with a variety of flours. However, it is not completely fructose free, so it does sometimes make my belly a little bloated. Some other good alternatives that I have tried are potato gnocchi, in particular the Golden Pasta range because it has a very small amount of wheat flour, or the Buon Appetito rice pasta range, which are made with only rice flour. Tip: I have found that the gluten free pastas don’t freeze well after cooked, so be careful with your portion sizes when cooking the pasta if you are planning to have leftovers.